Hello friends! It’s Lucky Friday the 13th and it’s time for another ScrapMuch? Team A Sketch-y Friday reveal! My last few weeks have been super busy and super challenging and I’m actually blogging on the fly from the airport right now. This layout is bittersweet for me because I was working on it one of my last nights with my sweet Socksie in my scraproom. Maybe it’s a bit fitting, I’m not sure yet. When I got Socksie and Matisse the digital era wasn’t really upon us, and now I have the luxury of being able to digitally document Bella and Tiffany as they grow in the family. By luck? kismet? serendipity? I welcomed Bella and Tiffany into my home on the same day, and snapped our first selfies as their furmomma (first of many I’m sure!). So without further adieu, I present Purrfect. And at the same time, introducing my dear sweet Bella and Tiffany! Bella is the black kitty from the local SPCA (yes, I am a proud rescue furmomma again), and Tiffany is the blue point Siamese kitten from a local home breeder. They have stolen our hearts and have brought us so much much-needed joy during some times of deep sadness. Bella had her name from the SPCA and was 8 months old at the time of adoption, and Tiffany was but 7 weeks old and named for my favourite jewelry store, and a wonderful movie too. Supplies used: Cardstock-Bazzill Basics, Stampin’ UP! ; Patterned paper-Bo Bunny; Ribbon-Pink Paislee; Die cuts-Simple Stories; Stamp-Dear Lizzy for American Crafts; Ink-Stampin’ UP! ; Wood letters-Pink Paislee; Pen-American Crafts. So now it’s your turn! Hop on over to the ScrapMuch? blog for some Team A inspiration. Craft your own layout and share it with us and you have a chance to win an awesome ScrapMuch? Prize! Here is a run down of our Sketch-y Friday rules. Just link up your creations in our sidebar to be entered into a random draw for our monthly prize. You have until March 29th, at midnight to participate in any of this month’s sketch challenges, each linkup tool will remain open until that date! I am so happy for you that you have new fur babies in your life! Pets are so wonderful! 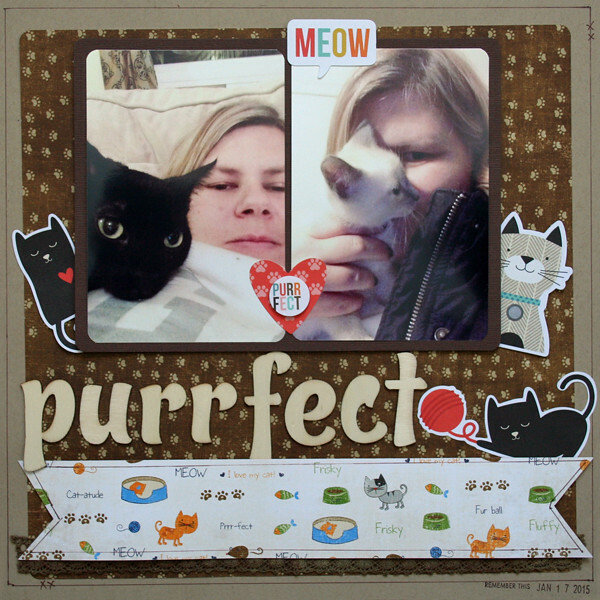 Great job on the layout….love your little kitty embellishments! Your kitties look so cute and I’m glad they brought you both some smiles when you needed them. Great layout Tiiu. Great paper choices and perfect title! LOL! Nice layout! So sweet! I love the playful cat embellishments. This is so sweet, love the pics and the perfect little embellishments!